I love to learn new things. I got a rigid heddle loom for my birthday back in April (second project) and while I have been enjoying weaving on it, I’m bumping up against some of the limitations of it already. I’ve been eyeing some patterns that I’d like to try out — twill, pinwheels — that are not easily doable on my rigid heddle without a second heddle ($50) and/or some string heddles. All fine and well, but … used looms pop up on Craigslist regularly. Since I also have some awesome alpaca rug yarn that one of my aunts sent me, I was looking for something at least 24″ wide so I can weave that up into a little rug. 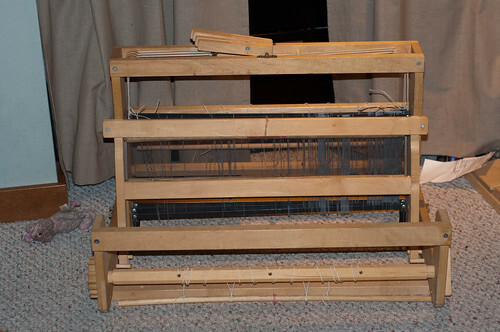 Patience finally won out, and I got this Rasmussen 4 shaft table loom at a reasonable price. It’s in good shape, though I need to clean it a bit (just dusty), pick up some lease sticks (I only have one! ha), and make a raddle. I think my first project on it will be the rug — tabby, weft-faced. I’m a little nervous and a little excited about warping a 4 shaft loom for the first time. Soon!